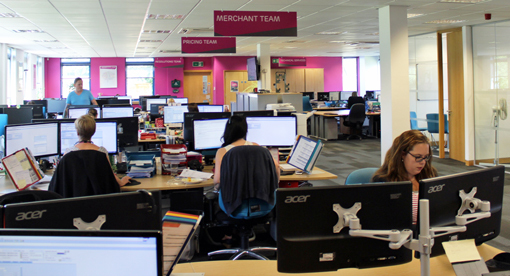 Here are some ideas we picked up on a site visit to the Siniat contact centre in Bristol. As part of an active ‘Build and Share’ programme, Siniat agents are expected to spend time off the phones learning about the different roles within the business. 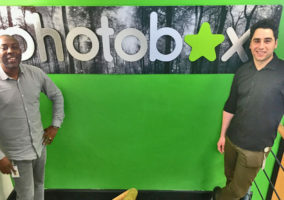 This extends to visiting customers on site to help smooth out day-to-day processes, as well as spending days out on the road with sales representatives or with the warehouse staff. Booking this time into agents’ work days helps them to understand how their behaviours impact one another. For example, an agent who has spent time with a sales representative, seeing the challenges they face out on the road, is likely to be more compassionate – and feel less frustrated – the next time their call isn’t answered straight away. It is really easy for food-related treats to fall into a mundane routine of ‘Pizza Wednesdays’ or ‘Sugar Fridays’. One way to keep things interesting is to ask your teams to take it in turns – over the course of the month or year – to put on a buffet for the rest of the contact centre. Variants of this include nominating a team member to “feed their team” each week, or organising this activity by floor (for example, a sales team would put on a buffet for the sales floor, while a customer service team would simultaneously put a buffet on for the customer service floor). These buffet lunches can be themed in line with current events. For example, red-coloured foods on Red Nose Day, or basing the dishes around the different countries taking part in the 6 Nations Rugby Tournament. It can be challenging for regional team leaders to give an issue their undivided attention – as their time is often spread thinly across different call types. If you are currently organising your team leaders by region, try arranging them by department instead. Streamlining your team leaders’ responsibilities by giving them a core focus (e.g. sales or customer care) should help to ensure each department – and its teething problems – gets the attention it deserves. It should also help you to deliver a proactive service rather than a reactive one. 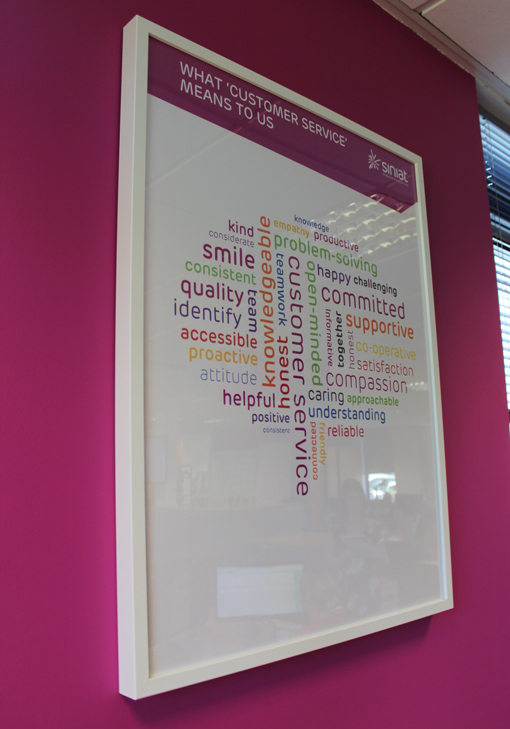 Instead of hanging generic artwork on your walls, get your agents involved in making word clouds – then frame them and hang them up near your agents’ workstations. Each word cloud should have a different leading question. For example, ‘What does customer service mean to you?’. Siniat run a reward and recognition programme called The Gilbert Awards (named in honour of their mascot, Gilbert the Giraffe). 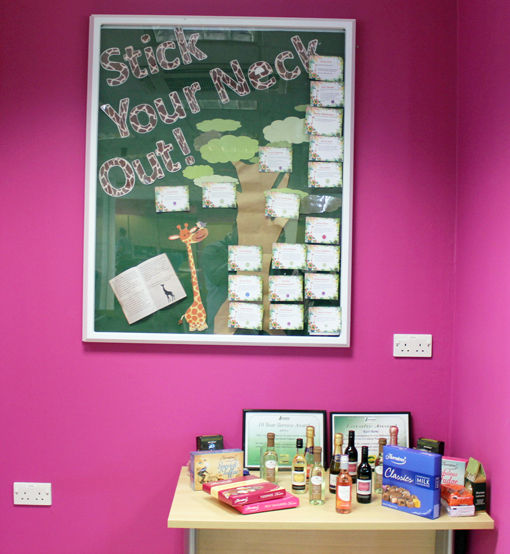 Throughout the week, agents can nominate their peers for “sticking their neck out”. The management team then gathers on the floor every Friday to celebrate the nominees’ achievements – with a prize-giving ceremony and a round of applause. The prizes include small, single-glass bottles of wine, bags of sweets and boxes of chocolates. 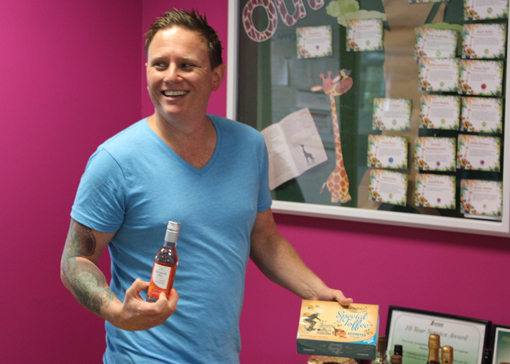 Cash prizes and high-street vouchers make for easy all-inclusive prizes when celebrating your Agent of the Month. However, these prizes are often frittered away on a series of small necessities rather than being spent in one lump sum as a treat – and so unfortunately they lose their impact. To overcome this problem, the management team at Siniat buy a gift for their Agent of the Month (AKA the overall winner of The Gilbert Awards) up to the monetary value of £50. These prizes have included a new body protector for an agent who enjoys horse-riding and restaurant vouchers to help fund an anniversary dinner. Megan listening in on some calls. Instead of randomly allocating agents to their roles, try asking them which area of the contact centre they would prefer to work in. For example, sales, customer service or technical support. This can be introduced as part of an office shake-up (by handing out preference forms to your entire staff and reorganising accordingly) or by raising the question in one-to-one review meetings. An agent-led approach should help you to improve employee engagement and motivation. Every Thursday between 2pm and 3pm, Siniat pull all of their agents off the phones for an hour-long group training session. During this time, all calls are diverted to a voicemail message which informs customers that they are closed for training and will be back on the phones at 3pm. Agents also remind customers of the forthcoming shutdown during a call, if they plan to call back later in the day. 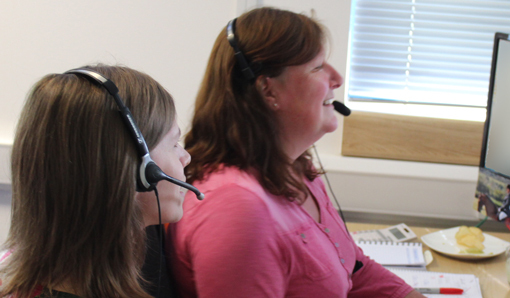 This has enabled staff from outside the contact centre to relay important updates with a single presentation and provide more efficient training and group activities including personality tests and team building exercises. Rather than setting up a monthly direct debit to a single charity, ask your agents to vote each month on where the donation should go. Siniat agents cast their votes with tokens, which are placed in one of three pots on the front desk. 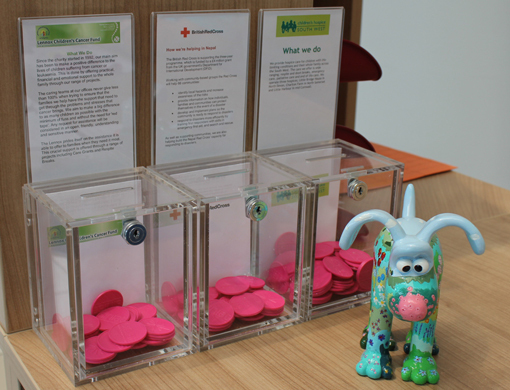 Each pot is assigned to a different charity – and the one with the most tokens (votes) receives that month’s donation. It can be difficult to maintain good communication links between your agents and field workers. Poor communication can prove very frustrating for everyone involved, especially when an agent has a customer on the phone and can’t update them on the field worker’s current activity. You can help to overcome this by using a live, shared-calendar tool, which will enable field workers to update their schedule on the road. Agents can then reference this information when talking to customers – and keep everyone up to date. 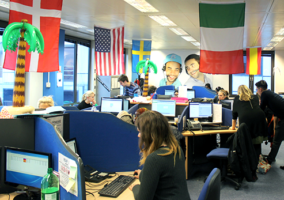 A plant-growing competition is a great way to brighten up the windowsills in your contact centre. Following a red-themed charity day in support of the British Heart Foundation, Siniat started a chilli-plant-growing competition – with categories including ‘biggest plant’ and ‘best yield’. 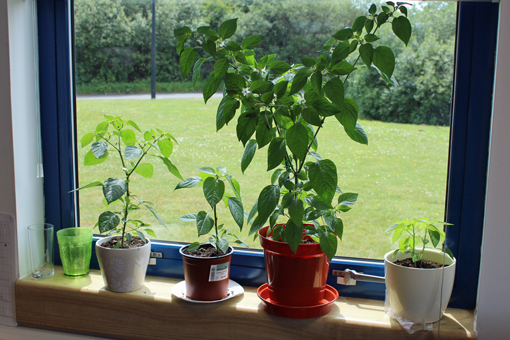 The chilli plants are thriving and the windowsills look great!